The City of Grand Rapids invited Michael Singer to propose a public artwork in a site of his choice within the city limits. Singer chose 600 feet of riverbank along the Grand River between the Blue Footbridge and the Fulton Street Bridge where he observed severe erosion of the river bank. Singer proposed a layered sculptural wall and keeping the existing mature cottonwood trees as an alternative to an Army Corps of Engineers’ proposal for a sheer concrete floodwall and the removal of the trees along the riverbank. With the aid of city staff and his team engineers, Singer was able to realize a sculptural environmental regeneration project that restores the river’s edge in a manner that creates habitat and engages the public, while simultaneously meeting the necessary engineering requirements of a flood wall. The 300 foot layered sculptural element is comprised of granite, concrete and pockets of soil and vegetation. The sculptural wall functions as a flood wall while softening the river’s edge with native vegetation and creating small niches that shelter birds and other wildlife living along the river. The sculptural wall is reminiscent of stone foundations from an earlier time, emerging through the steep side of the riverbank. 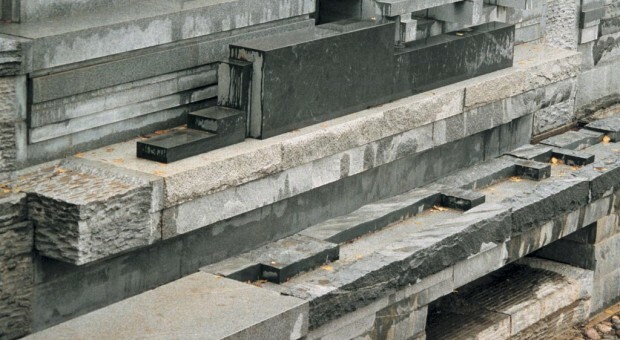 The indigenous plantings as well as the patina of the stone encourage associations with the past. The project also includes a fully accessible walkway to the river’s edge to connect the public to this natural and historic place central to Grand Rapids. The Riverwalk Floodwall became a key precedent for further redevelopment of the river’s edge and riverfront walkways in downtown Grand Rapids. This project has been cited in numerous publications and lectures as an infrastructural innovation that integrates engineering, environmental regeneration and public art into a singular holistic project. Engineering and Landscape Architecture: Varusian Hagopian and David Mittelstadt, both at Sasaki Associates, Inc.